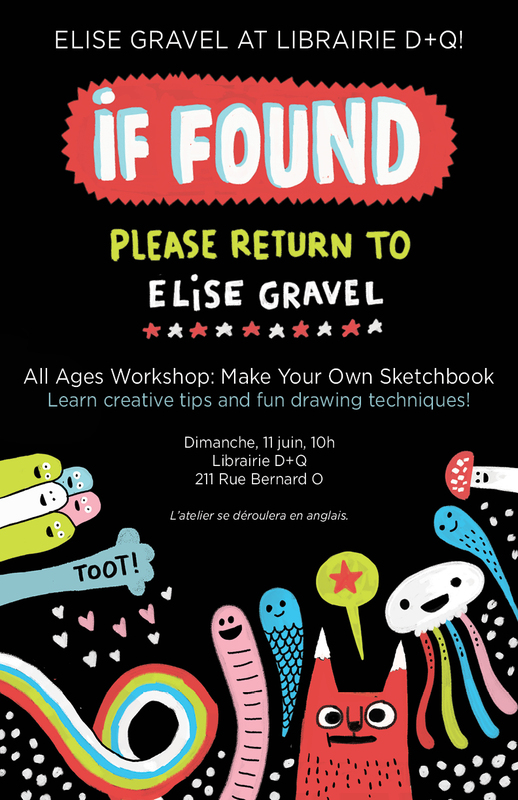 Join beloved Montreal-based children's author Elise Gravel as she hosts a special interactive Make Your Own Sketchbook workshop at the store on Sunday, June 11th at 10 AM! Elise will be sharing her tricks of the trade in celebration of her brand new D+Q book, If Found... Please Return to Elise Gravel, which models her real life sketchbook. During this workshop, Elise will teach children how to put their creative impulses and imagination to play! ELISE GRAVEL is an author illustrator from Montreal, Quebec. After studying Graphic Design, Gravel pursued a career writing and illustrating children’s books, where her quirky and charming characters quickly won the hearts of children and adults worldwide. In 2012, Gravel received the Governor General’s Literary Award for her book The Great Antonio, about the famous Montreal strongman with a heart of gold. A prolific artist, she currently has over thirty children’s books to her name which have been translated into a dozen languages, including I Want a Monster! and The Disgusting Critters series. Elise Gravel still lives in Montreal with her spouse, two daughters, cats, and a few spiders.